Hi everyone! 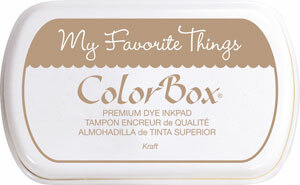 The My Favorite Things team is back today with our second day of January previews. 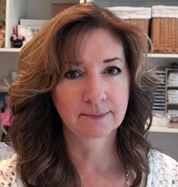 Today we’re sharing samples using Laina Lamb’s new sets, Document It Off the Chart and Journal It For the Record. 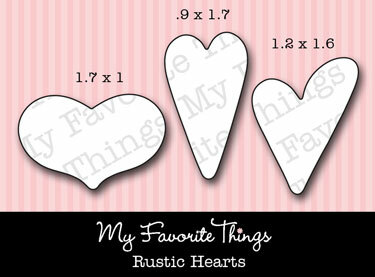 On my card today, I used Journal It For the Record, Document It Off the Chart, and new Die-namics Boy Meets Girl, Rustic Hearts (Lisa Johnson Designs), Accent It Labels and Tabs and Insert It 3×4. 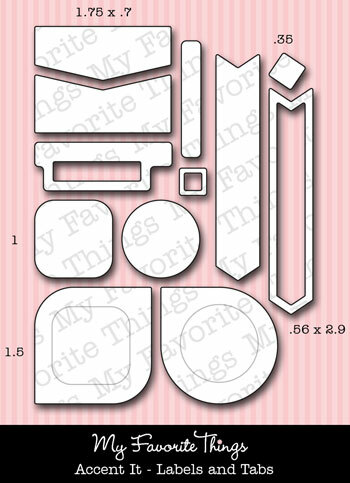 I *love* Laina’s Labels and Tabs Die-namics. So many pieces to choose from. I used the arrow die, which cuts two pieces at once. I used it to cut Kraft and Whip Cream cardstocks. 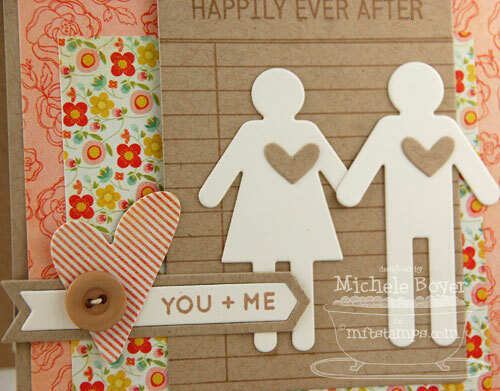 I used gorgeous new Kraft ink to stamp the You + Me and Happily Ever After. I used Hemp Cord to stitch a Kraft Button to a Rustic Heart, and the small hearts on the boy and girl are from Layered Heart Border Die-namics. On the inside, I stamped another sentiment from Journal It For the Record and added a tiny boy and girl from the Boy Meets Girl border strip. You can attend the New Release Party on January 8 from 8-10 PM EST HERE in the MFT forum, where you can WIN PRIZES! 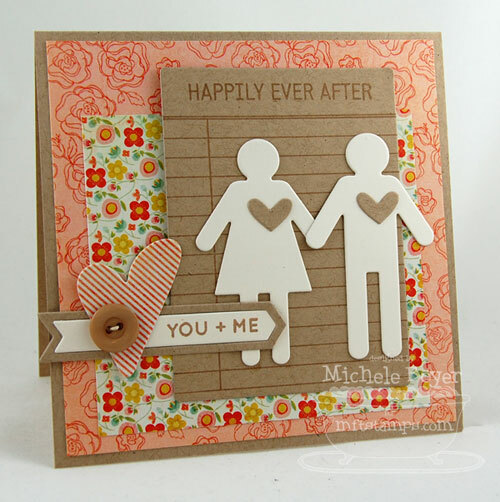 The MFT release, including all new stamp sets and Die-namics, is on January 8 at 10 PM EST. You’ll find all the newest products HERE at release time. If you’d like to see all the teasers for today, please click on over to the MFT Blog NOW. Be sure to leave comments as you go for the chance to win one of 2, $10 gift certificates given away daily. The winners will be posted on January 8 just before the release party, on the MFT blog. Beautiful card. I love the dimention and colors you used. Beautiful card! I love the papers and the colors are so pretty. I love it, Michele, again thanks for the inspiration! Ooooh, the colours on this are gorgeous Michele!! Such a lovely card!! GORGEOUS card Michele! LOVE the layout, papers and the elements on this!! SO super sweet!!! Stunning card Michele, love how you’ve added those tiny hearts to the people and the tiny peeps on the inside of the card! Such a great card. Love the colors you used. beautiful card… love the colors! Love the colours and papers you’ve used. Such a pretty card! Super sweet. Love your card. Love the colors on your card!! These new dies are so fun. 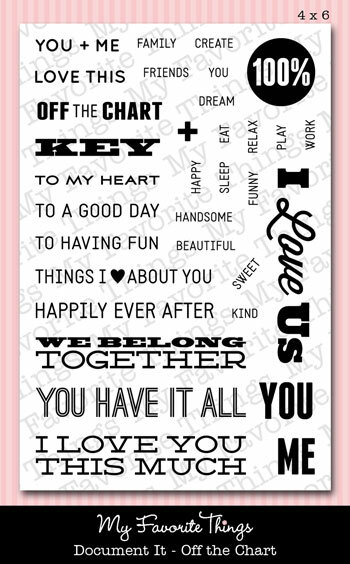 Great Sentiment set!! Love the dies too! Thank you for sharing! Lovely card! Beautiful colors!!!! Love the design! What a sweet card. 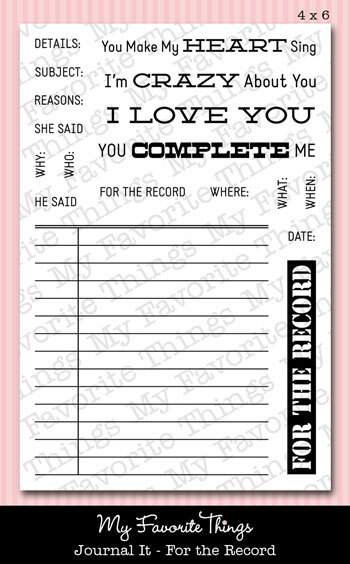 Is perfect for an anniversary, or even Valentine’s Day. All the new dies are just going to break my bank. they keep getting better and better. Very cute. 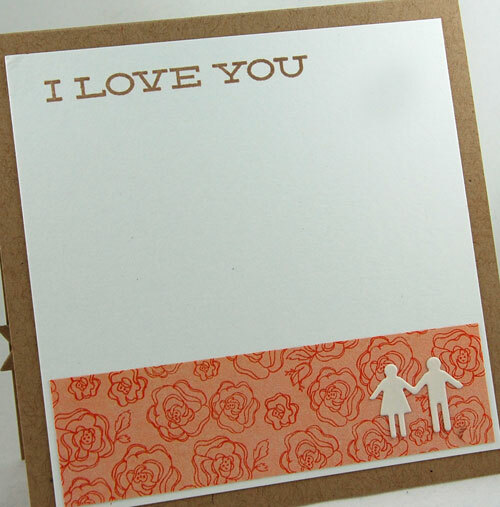 Love your colors with the Kraft paper. Gorgeous card! I think it is going to be a very expensive release for me! I love it ALL! This is adorable. Love the colors. Holy…Boy meets Girl! This card is Soooo Ca-Ute! Love, Love, Love!